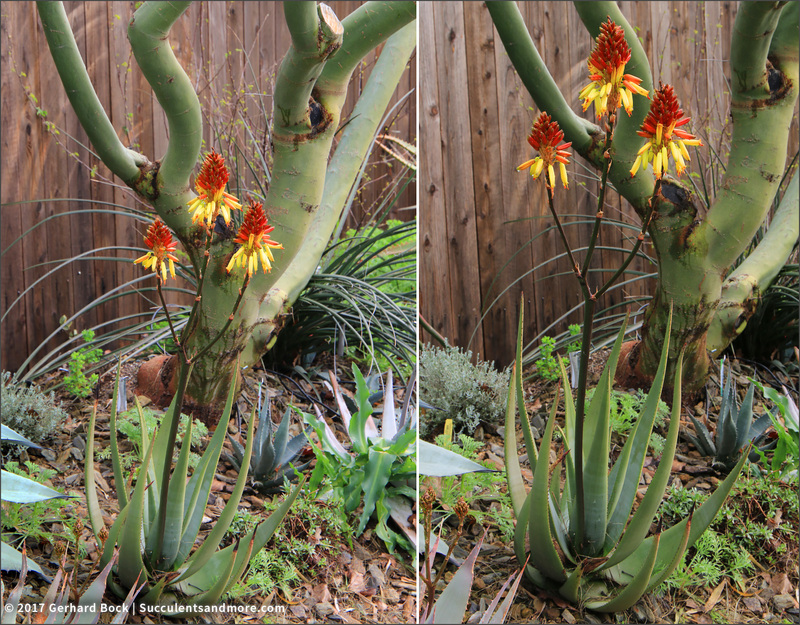 My last post about leaf rot on agaves promoted by the seemingly never-ending rain here in the Sacramento Valley was a bit of a downer. 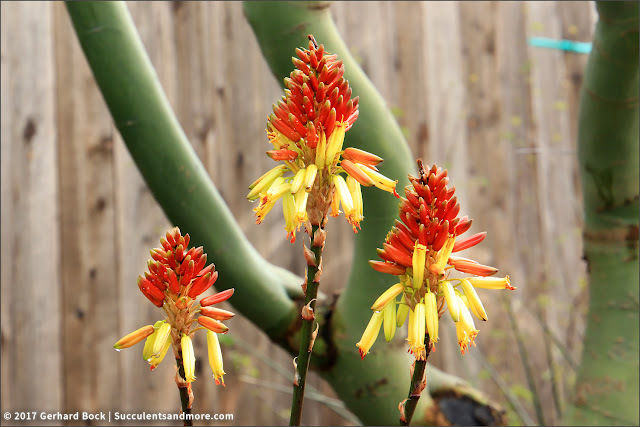 This post is much more upbeat because many of our aloes are finally blooming. It took them noticeably longer to get there this year as a result of the wet and cool weather. But maybe this means that the flowers will last longer? All three clumps of Aloe 'Moonglow' have flowers this year that seem more orange than the creamy yellow that I remember. Maybe my brain is seeing this particular hue differently this year? 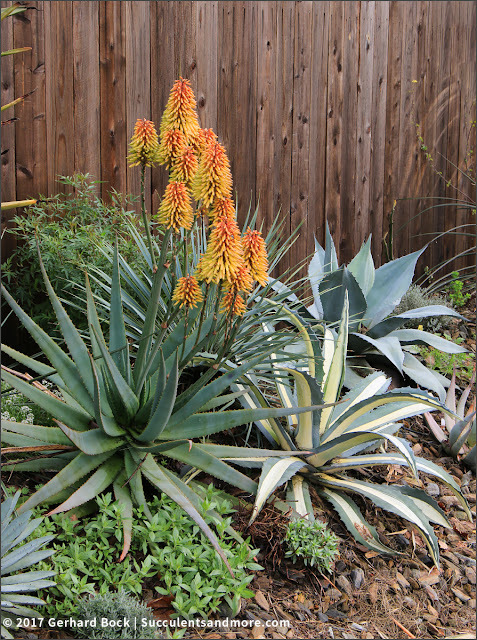 Variegated Aloe arborescens in front of regular A. arborescens. 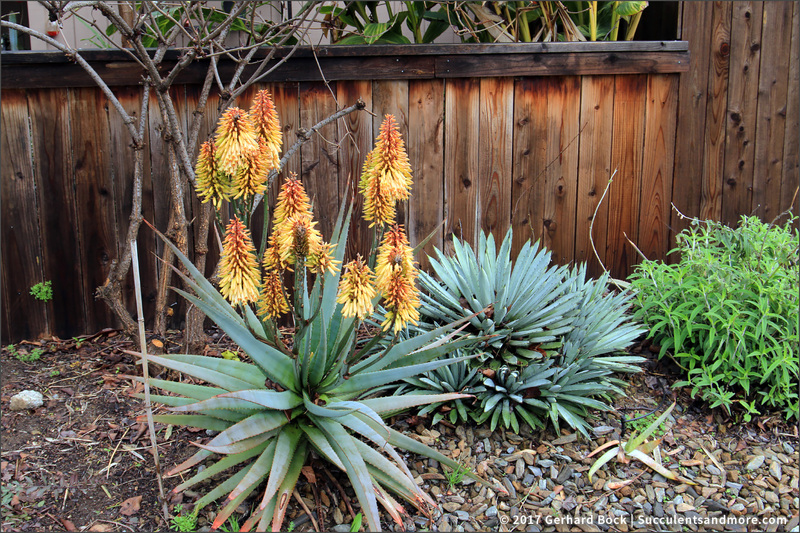 The latter is a very shy bloomer for me--so much so that I'm considering replacing it with a more floriferous clumping aloe. 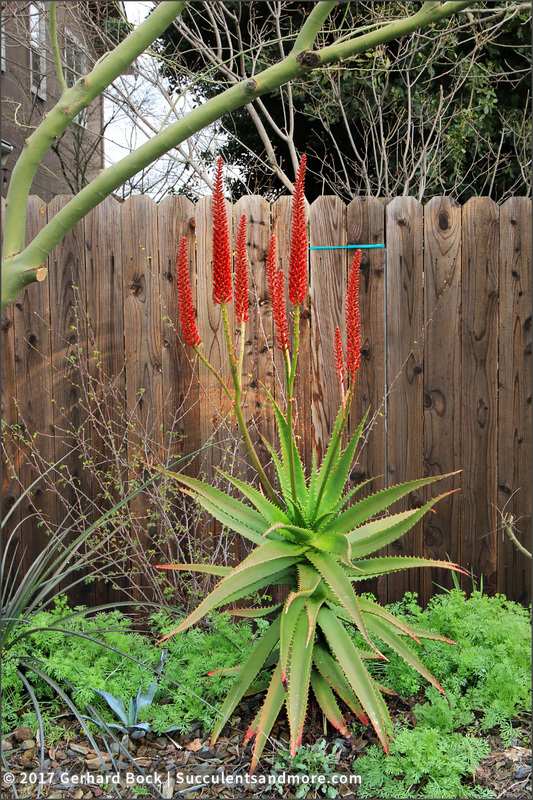 Aloe petricola, blooming for the first time. Notice the bi-colored flowers. The agave to the left is Agave mitis ( formerly Agave celsii), the one to the right is Agave macroacantha. Clump #2 of Aloe 'Moonglow'. Behind it is Aloidendron 'Hercules'. Different angle. 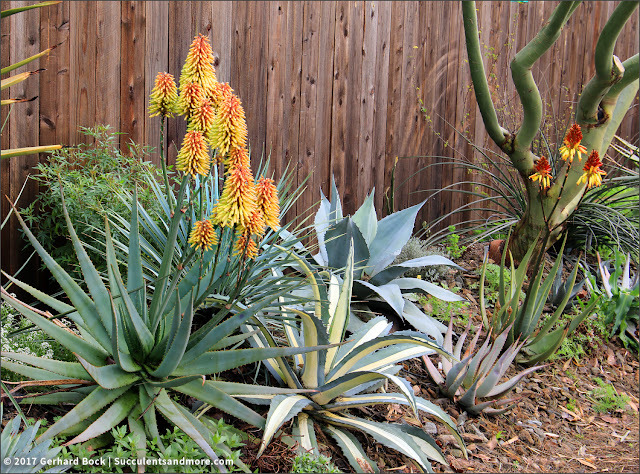 The agaves next to Aloe 'Moonglow* are Agave americana 'Mediopicta alba' in the front and Agave ovatifolia in the back. The flowers are stunning, aren't they? 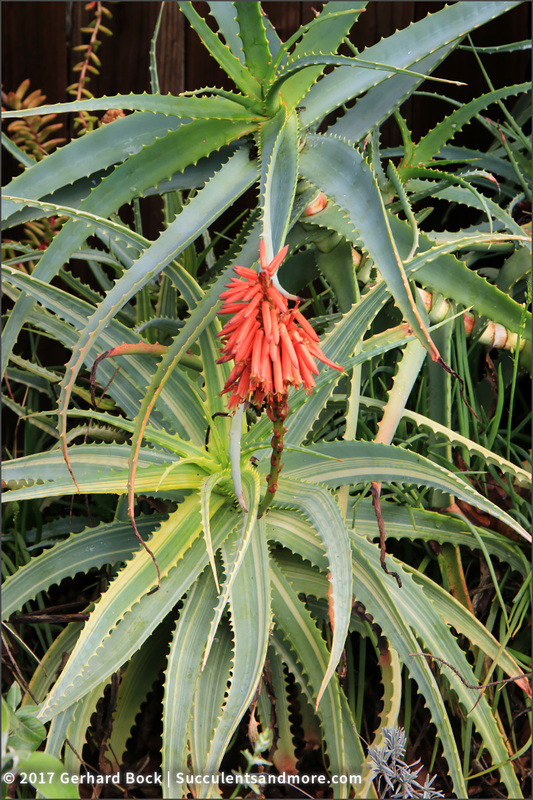 This is the first time this Aloe cryptopoda has flowered. Beautiful! 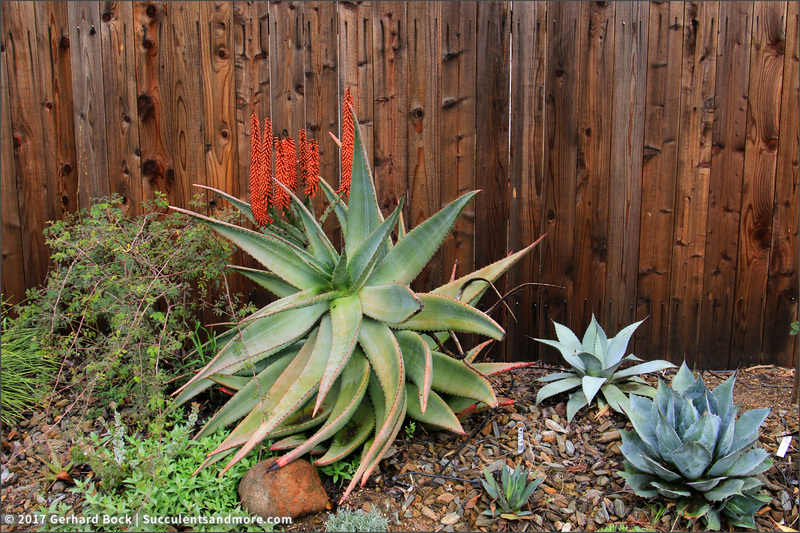 I wonder what causes aloes to bloom? 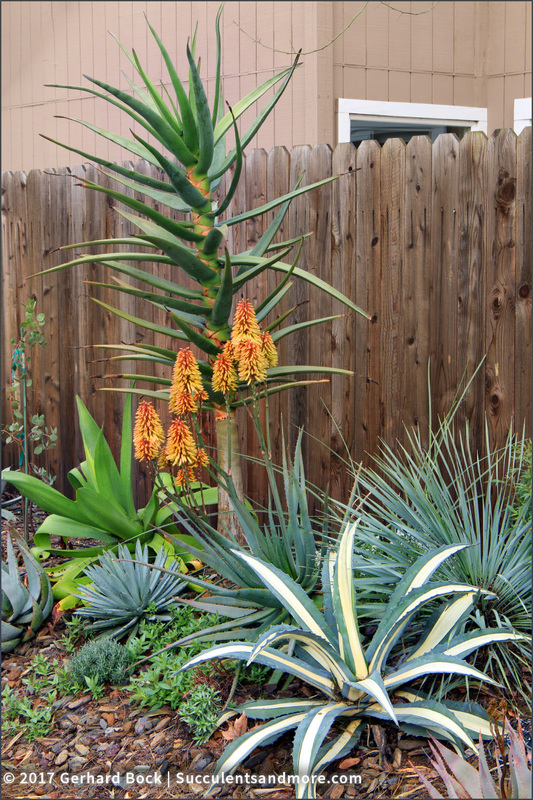 My A. arborescens is long gone, They didn't last as long as usual, but Blue Elf is just now pushing out bloom stalks. Jane, most aloes are winter bloomers and presumably flower in response to shorter daylight hours. I just found this article from 2007 that describes the molecular command that signals that it's time to produce flowers. it's encouraging to see your Aloes not only blooming but thriving in winter. Do you cover any or these ? I will definitely put a couple in the ground this year. Kathy, I did cover most of them on the coldest nights in hopes of saving the flowers (they're about 3-5°F less hardy than the plants themselves). I was mostly successful, with the exception of that one Aloe hereroensis. 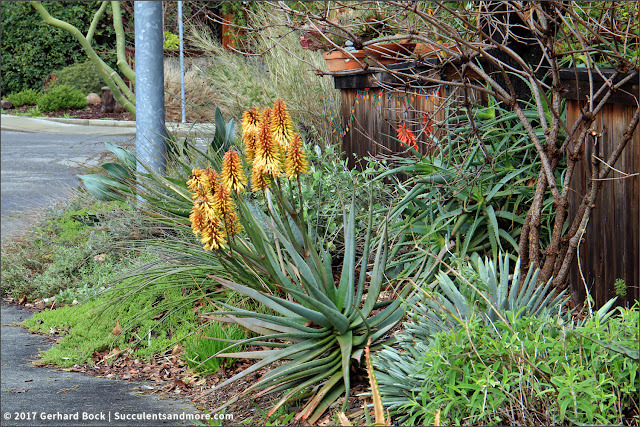 Many aloes are fully hardy here and hence in Napa. 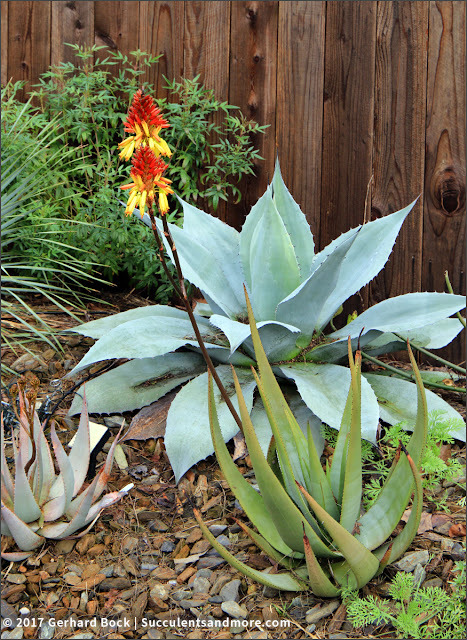 This PDF from the UC Davis Botanical Conservatory is a good resource. Gorgeous! Do they usually bloom all at once like that? 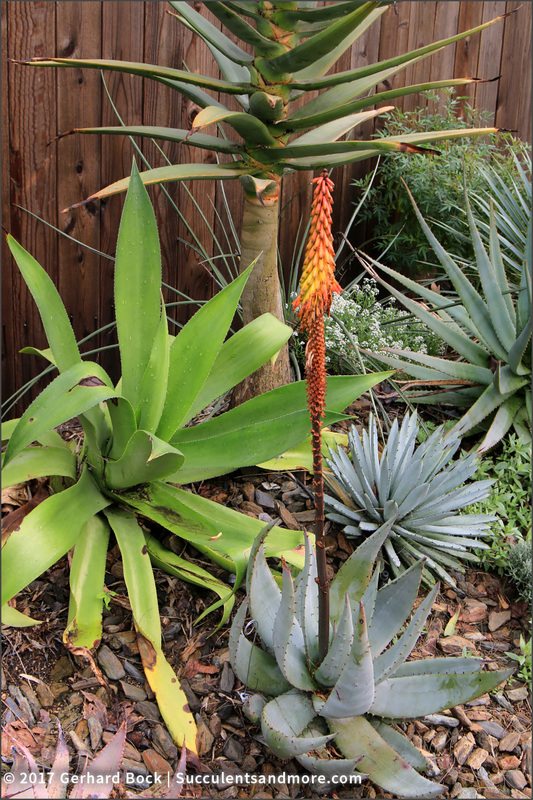 Other than 'Johnson's Hybrid' and 'Rooikappie', only my pint-sized aloes seem inclined to bloom. I look forward to the day my A. wickensii (which I gather I need to relabel) and my A. vanbalenii are mature enough to bloom. Yes, they pretty much bloom at the same time. Your garden is large enough, and your climate mild enough, to plant a few tree aloes. Everything looks fantastic. Love the moon glow! Beautiful colors! Thanks, Candy. Your 'Moonglow' looks good too. I'm in awe! If this were my garden I wouldn't be getting anything done, I'd just be out there gawking at the gorgeous blooms! LOL, I might do the same if it weren't for the fact that this bed is next to a sidewalk :-). Really pretty scene. Perhaps 'Moonglow' has richer color because of a lot of overcast? My marlothii seems more intensely colored this year and I wonder if it is because of all the cloudy days we've had. Some flower stems emerging from 'Fire Ranch' now. Maybe so. Or maybe the flower color does change a bit as the plant matures. My 'Fire Ranch' has NEVER flowered and it's 10 years old now! Maybe this year, with all the rain? Whoops, you got near-normal rain last year, right? So it's not lack of water. ??? Wow, this is stunning! 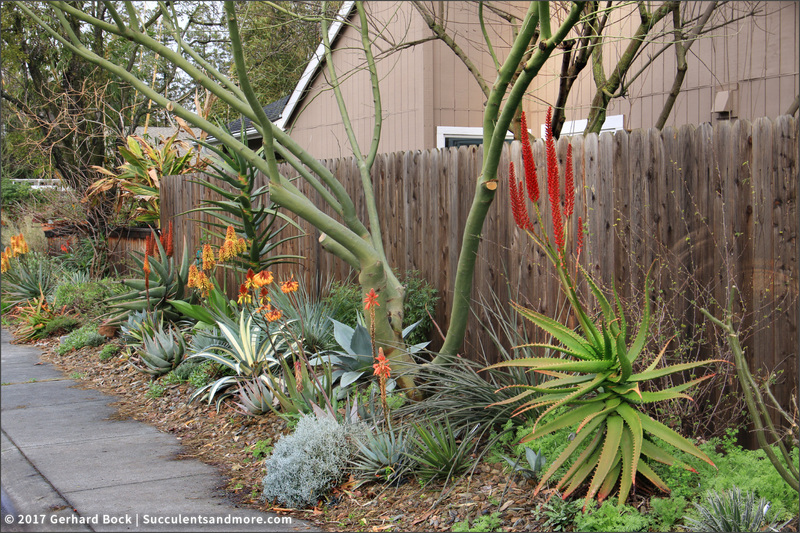 I bet this display will have your neighbors planting these beautiful aloes!!! 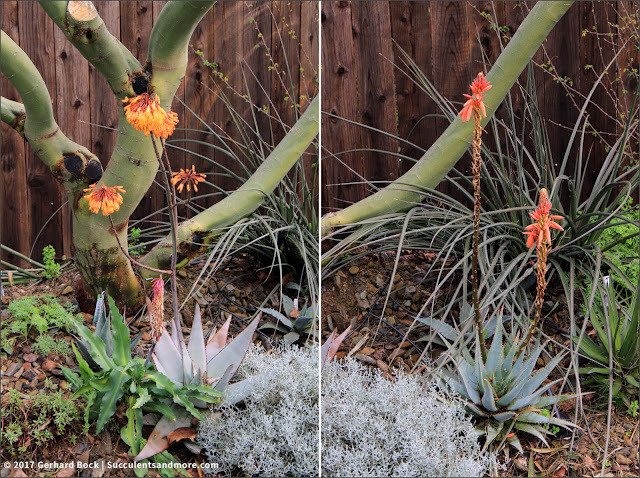 My 'Moonglow' looks identical in color to yours, with a very orangey blush, albeit just one scape. What an incredible show! Erik the Red in particular is incredibly majestic. 'Erik the Red' is getting better year after year. The flower color is incredible. Morning Gerhard, I was wondering about the Hercules Aloe in your photos. 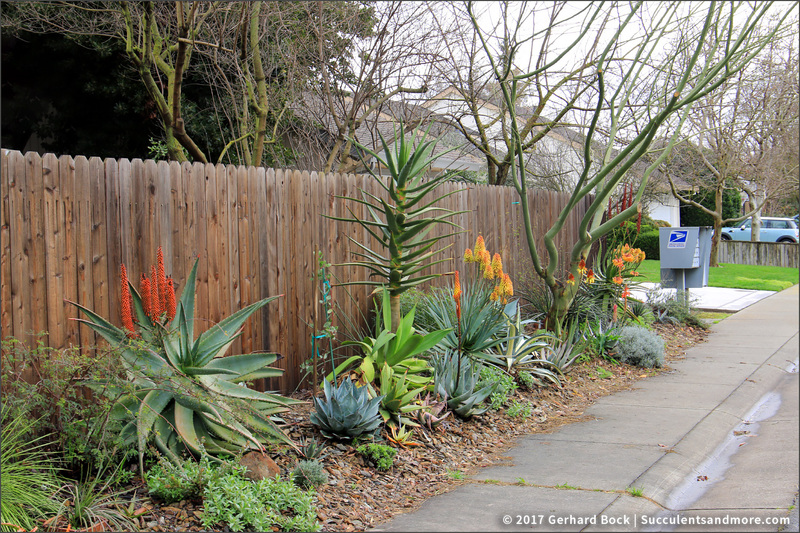 Does its eventual size cause a problem for the fence or the sidewalk? I have a 2 + year old specimen and I am trying to find a place for it in my yard that will accommodate its potential size. Our 'Hercules' should be fine. 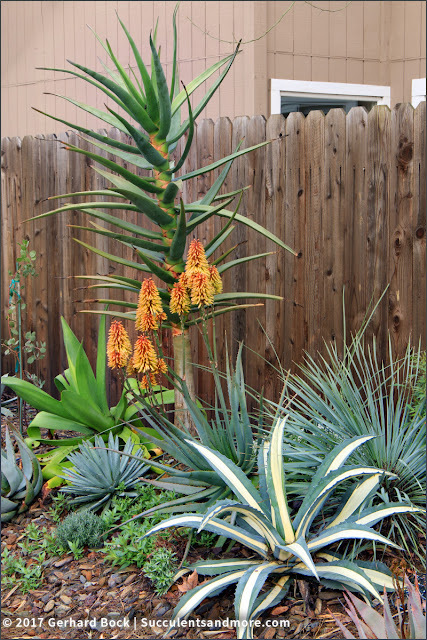 We planted it in the middle of the 6-ft bed, i.e. 3 ft from the fence and 3 ft from the sidewalk. I think it'll be perfectly fine here for many years to come. At least that's my hope.